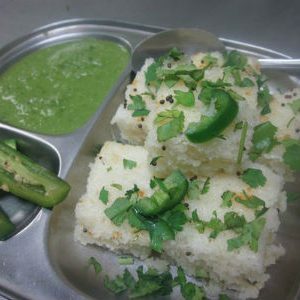 Dhokla is a fast food from the Indian state of Gujarat. 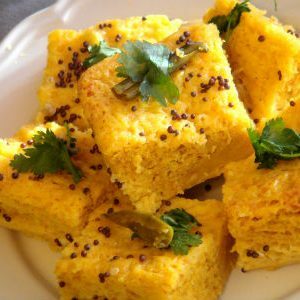 Dhokla can be made of ground chana dal (chickpeas). Chickpeas are soaked overnight, some other recipes call for besan. This paste is left for fermentation for four to five hours, then is spiced by adding chile pepper, ginger, and baking soda . The dhokla is then steamed for about 15 minutes on a flat dish and cut into pieces. It is usually served with green chutney or some peanut oil as a side dish. 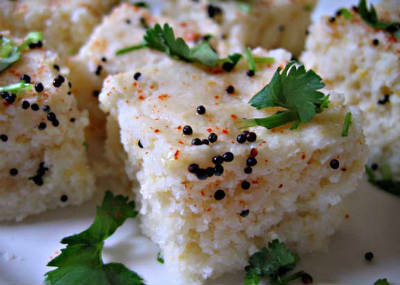 Dhokla can also be fried further with mustard seed for extra spiciness. It is garnished with coriander. We have 19 Dhokla recipes in this category. Here are the most popular Dhokla recipes from Awesome Cuisine ever.